Are You Struggling to Get Traffic to Your Web Site? ...And Enjoy A Steady Stream Of Laser Targeted Prospects from Leading Search Engines!" While you are reading this, your prospects are searching for their requirements on their favorite search engines like Google, Yahoo and Bing. Will they see your name there or your competition's? "We were working with other SEO companies that didn't generate even decent results for us. Then I contacted SEOtop10 and got amazing results...we are now experiencing a large volume of orders and new customers because of the #1 listing on Google, Yahoo and Bing for around 3 years now." More than 200 million times a day, people search for what they need on Google and its partner sites. 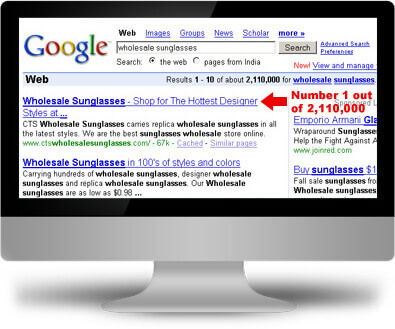 Google results are displayed on top search engines such as Google, Yahoo and Bing. A very potent combination! Yahoo is one of the most visited sites in the world enjoying an Alexa ranking of 1. Bing is another very important search engine as it is the default search engine for most of the Windows users. A top 10 ranking on these search engines will do wonders for your traffic and provide you new and most importantly, targeted prospects, whether you are a local joint for Mexican Burritos or market a restaurant software. Your Toughest Marketing Challenge - Solved! With hundreds of thousands of new Web pages being added to the Internet daily, a marketer faces a BIG challenge. "How will searchers and good prospects for my product or service ever find my website?" Will they go to the 2nd page of results? Do you? Internet searchers are not willing to spend hours looking. If the searcher finds your website in the first page of the results, he is likely to click over to your website. You just discovered a qualified and targeted prospect! Just imagine how a top 10 ranking can drop several hot leads into your sales funnel every day. Convert these visitors to paying customers and smile your way to the bank. And guess where they'll go the next time they need the same product or service! This is all the more true for mobile searchers - your iPhone websites have to really be listed on the first page to get the coveted click. Why not? Did you study the snapshot above? This website belongs to one of our clients and ranked #1 and #2 out of 2,060,000 results on Google with our efforts. You can enjoy similar top 10 ranking and get lots of targeted prospects as a result. Great job! We are already getting Top 10 ranking for several keywords. Thanks for your hard work! Do we use only accepted and ethical means? You bet! We use only accepted and ethical means to improve your site ranking. The search engines like Google, Yahoo and Bing look at certain areas of your website for relevance to rank the sites. They also check out your website's link popularity. As search engine optimization experts, we optimize your website by changing these elements, so that the search engines believe that your site will be highly relevant to the searcher's query and gives it a top 10 ranking. These changes do not alter the look and feel of the website. We also generate high quality incoming links to your website to boost its link popularity, including submission to some top directories, issuing press releases and setting up blogs. We also offer dependable web maintenance services for overall improvement of targeted traffic and improved conversion of visitors to prospects. However you must keep in mind that you have to have top 10 ranking on terms, also called keywords or key phrases, which are popular and generate a high number of searches. It is no use getting a Top 10 ranking for, say "gooblydook okidoki". We analyze your site (consumer goods or engineering) and recommend the keywords and key-phrases you should target, in consultation with you. In general, you must always target the exact key phrase that describes your product, for getting top 10 ranking that produces more sales and profits. Thus, "5 star hotel" is much more profitable than "hotel". If you are looking for targeted traffic that can generate sales and leads, do not try to rank for single words like 'hotel'. This is difficult and meaningless. You should always target exact and longer keyword variations. In fact, we do not accept requests for single-word search terms. AllTheweb, Altavista, HotBot and Lycos? You can expect to get excellent rankings on these 'other' search engines after our optimization process is complete. However the traffic that these search engines deliver is very little, so we do not focus on these search engines specifically. We mention Google, Yahoo and Bing only just because it becomes easier to record the performance and quantify the performance criteria for guarantee purpose. Also remember that while you pay us only for the agreed-upon search terms, you will automatically be ranking quite high on similar terms. For example, when we work on top 10 ranking for "5 star hotels", you are also getting pretty good rank for "star hotels", and like. BONUS: These rankings on other terms and other search engines are your bonus and you get the traffic from these terms for FREE. The Full Profit Potential Of Your Business NOW! "I never imagined our site could be in Top 10 ranking in Google search engine. I did not believe you when you offered to do this with money back guarantee. And I don't believe it even now, when we are there, within 2 months. It is really value for money! We will recommend you to many people." We start the optimization process immediately upon receipt of your payment and finalization of the keywords (or search-terms). Your money is absolutely safe (see our guarantee below). If the desired top 10 ranking has been achieved for some of the agreed key phrases but not all, the corresponding sum will still be payable. Each key phrase will be treated separately for this purpose. Fair? Please note that we have to do considerable general work for each web site and hence, we can only accept orders for a minimum of 2 search terms per web site. We accept orders for search-terms having minimum 2 or more words like "honda dealer", "Houston surgeon", "new york nursing home". 1-word terms will only be accepted when these relate to some unique product like 'adstar'. I personally guarantee that your web site will achieve a top 10 ranking on any one or more out of Google, Yahoo or Bing on agreed terms within 180 days of order confirmation date. (Though most of our clients have achieved their top 10 ranking within 60-90 days only). Just in case, we cannot achieve this ranking for certain key phrases, we will refund 100% of the amount paid to us on account of those terms. We will issue a courteous refund of the due amount within 2 business days. What's more, you can even keep the optimized web pages and the achieved ranking improvement. You only need to pay us in full for the search terms for which we have achieved the agreed top 10 ranking. Tell us something about your web site and we will get back with a detailed proposal on how we can help you locate FREE, targeted and qualified prospects for your site. Get ready to enjoy top search engine ranking and hordes of targeted visitors! P.S. A Top 10 ranking on Google, Yahoo and Bing, on the right search terms can skyrocket your traffic. You can recover your small investment within days with all the new clients that you are going to get as a result. You have nothing to lose with our risk-free 100% money-back guarantee. What are you waiting for? Don't let your competition walk away with all the prospects who are searching for your products and services. Ask for a FREE proposal for top 10 ranking on Yahoo, Google and Bing for your site before you get distracted. Get started NOW. "After Google made some big changes in how they ranked websites, our rankings seemed to disappear from Google. Then we contacted SEOtop10 to see what they could do for us and we were back in the top 10 for our 2 main keywords in less than 45 days! Great work."